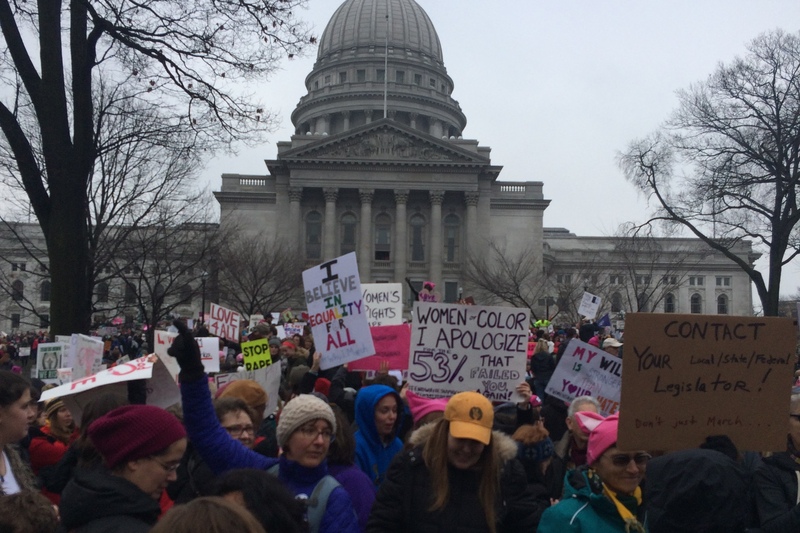 On Saturday, Jan. 21, Walker and Schibline were compelled to take part in the Women’s March in Madison. It was the first act of protest for Walker, a West Bend East High senior who will turn 18 in February. Schibline, a senior at West High, had some experience with peaceful demonstrations, having previously protested at the Trump rally in August at the Washington County Fairgrounds. The march began at the beginning of State Street and ended at the capitol building. Walker and Schibline engaged in various chants and cheers that promoted equality for women and minorities. They walked for about three hours and noticed that there was a diverse group of people participating, from young children to elderly men and women. “To have the opportunity to come together with people of every gender, color, religion, age, and sexual orientation to bring awareness to these issues [of equality] was something I wanted so badly to be a part of,” Schibline said. Although the process of the election has been polarizing, it has managed to unite an entire group of people across the world in support of equality for all people. 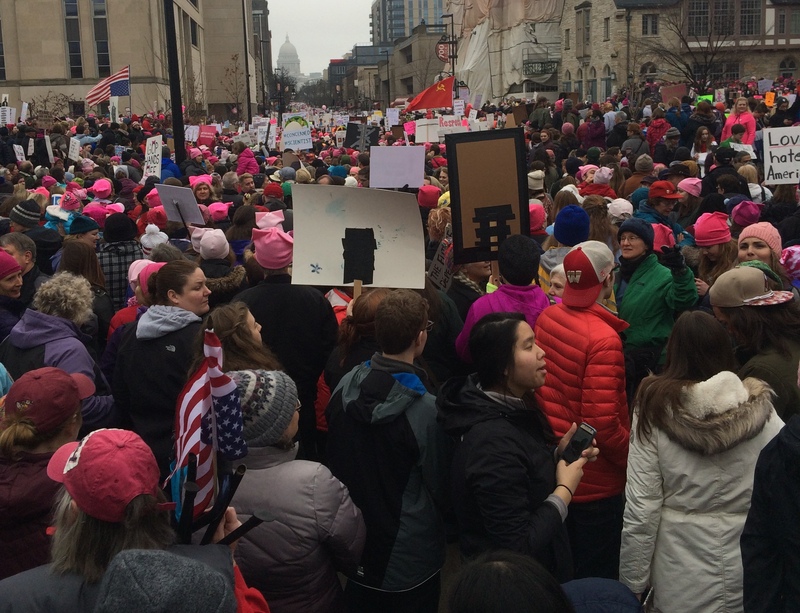 Walker said that there was an estimate of 100,000 participants in Madison, and a total of three million participants across the world. Moving forward, both Walker and Schibline feel that women should not be the only proponents of women’s rights. Cassiy & Andie – I’m proud of you for becoming a part of the attentive public and exercising your freedoms of speech and peaceful assembly. It doesn’t matter the issue or ideology, politician or party – participation is essential to preserve our American democracy. A real demonstration is always peaceful and protected (and encouraged) by the 1st Amendment to the U.S. Constitution. I’ m glad to read about these young people exercises those rights. Be aware that there are various local groups working toward protecting civil rights for all of us. To be frank, this article really shows the types of folks who engage in these types of protests: people who protest for freedom of speech and equality, but who protest a politician’s right to speak. Rights for minorities have already been established for some time, in fact, I believe that of all people, whites are those being oppressed by minority interest groups like Black Lives Matter. If you believe in equality for women, you should protest the fact that women make up more than 90% of all nurses and kindergarten teachers, but make up less than 10% of all construction workers and other skill trades. Blacks and minorities are being infantilized by programs like affirmative action, which seek to lower the standards of an entire race or ethnic group, simply because they are made that way. If you are unaware, that is called racism, the preferential treatment or subhuman treatment of another based upon the melanin levels in their skin. I believe in the first amendment and I think that everyone has the constitutional right to protest their political beliefs peacefully. While it is true that marches remained largely peaceful, anti-Trump rallies have left many Americans injured, regardless of politics, that is disgraceful. The Women’s March in Washington D.C. had no arrests because there was no police backlash after the marching had been canceled due to a large turnout, and they marched anyway, straying from the previously canceled marching route, too.